Metal screen-printed electrodes are promising, cost-effective SERS substrates. 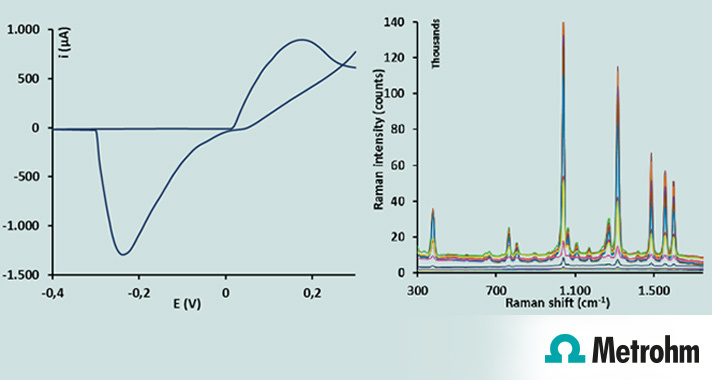 In this white paper Alejandro Junquera Pérez, Pablo Fanjul Bolado, David Hernàndez Santos demonstrate the time resolved Raman spectroelectrochemistry measurements with screen-printed electrodes. In this work, time resolved Raman spectroelectrochemistry measurements with screen-printed electrodes are shown. The instrument used combines in a totally integrated box: a 785 nm laser source, a high resolution Raman spectrometer and a bipotentiostat/galvanostat. Experiments are controlled with an excellent spectroelectrochemical software which allows real time data collection and useful data treatment.